GARDENERS have at last discovered the huge benefits of using Amazing Dammetjies for a range of uses in their gardens. Not only do Dammetjies save water, which is important enough, but they promote plant growth at the same time by keeping the soil within the Dammetjies moister for longer. And gardeners who use them say it takes the drudgery out of watering, making it far faster as you fill up the Dammetjie and leave the water to slowly soak away while going on to the next one. Since being invented by Geoff Bird and patented 10 years ago, almost 100 000 Dammetjies are being used in gardens in South Africa and Australia. Designed originally for rose bushes that need a lot of water, today Dammetjies are also being used around a variety of shrubs, saplings and even herb plants. They are also especially effective when planting on sloping ground, storing the water around the plant stem and preventing runoff and wastage. They are ideal for holding mulch which reduces evaporation in summer and protects the plant from frost in winter. What appeals to many gardeners too is that expensive plants can never again be ring barked by careless garden workers wielding weedeaters. "We renewed the Dammetjies patent this year for another 10 years because sales have been steadily increasing in the past year", said Geoff. "It is taken a long time and much marketing to get out message across that our Dammetjies are truly amazing. I am very happy with the dammetjies and would like to place an order for another 20 mud brown dammetjies. Please raise an invoice in order for me to make the payment. We are in the process of pruning roses at the moment and will be running short of the dammetjies! Please will you send me another 50 asap! Will transfer payment as soon as I get the invoice - would have done it, but the price may have changed. Nogmaals Baie Dankies vir al jou moeite met die dammetjies. Omdat die posbus 'n entjie van die huis is gaan ons net 1x per week pos kyk. Ek dink dit was al lankal daar, maar ons het dit Vrydag gaan haal. Dit was nogal 'n belewenis by die poskantoor, aangesien hul 'n boks pakkie verwag het. Intussen wag en wag ons en hul soek en soek. Na hul naderhand kom vra het wat is dit want die nommer is in hul boeke geskryf en al wat hulle vind is die pakkie. Uiteindelik kom hul met dit aan. My opgewondenheid was amper gedemper en het gedink, ja-nee dit is seker weg! Weereens baie dankies vir al die moeite en dit sommer ook vinnige diens ook!. Sal dit beslis aanbeveel. Dan is dit ook betyds vir my rose snoei sodat ek dit kan "install". Hoop die ergste koue het al die wyk geneem daar in Oudtshoorn. Hier bly maar vrek koud in die aande en oggende. Sterkte met jul dammetjies se besigheid en vertrou dit sal net aan hou om te groei. Thank you for the Invoice, I have made the payment, please see attached. I am positive that your dammetjies will make a huge difference to our watering routine. We collect rainwater in jo-jo tanks for the garden and we water the roses by bucket twice or three times a week depending on the weather and are always looking at ways to be water wise in the garden. We are so looking forward to seeing them in action. My dad keeps on asking if I have ordered them yet and tomorrow I will be able to tell him that we will have them soon, I will also convey your regards to him, he will be so happy. Thank you, Geoff and I will keep you up to date with photos showing our progress with your dammetjies! Hope this finds you well. Your dammetjies are amazing and it makes the garden look so neat and tidy as well. Can you please be so kind as to send me an invoice for another 15 mud coloured ones. I had no idea that I had so many rose bushes. The delivery address remains the same. Thanks so much for the latest delivery which was received on the 30 June. Much appreciated. 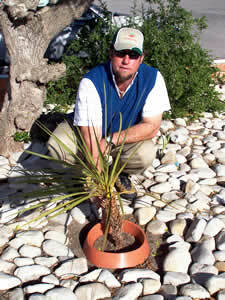 I must admit that using dammetjies is quite a good concept as I have aloes, succulents, cacti and roses in my garden. Now the watering process is so much simpler and I can accommodate all the specific water need. Will send pics when the roses are in full bloom. Dammetjies were patented by inventor Geoff Bird who designed the "small dams" to combat the unpredictable rainfall and even semi-drought conditions in Southern Africa. 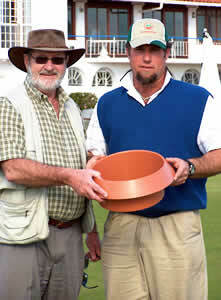 Dammetjies inventor Geoff Bird (left) and Anthony Bernstein, horticulturalist and course manager at the Humewood Golf Club in Port Elizabeth. Bernstein strongly endorses Dammetjies as a great water-saving device for gardeners. A Dammetjie in thelatest unobtrusive colour.